Your maps, photos, videos will be sublimated ! Our tools are easy to use, just focus on your trip, we keep your adventures safe ! 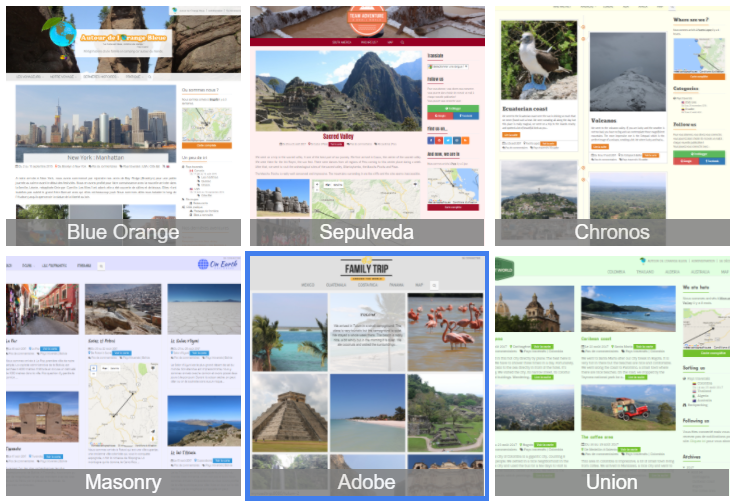 With TrotBlogger, enjoy a powerful blogging platform with high customization possibilities, our tools have been designed for travelers, you don't have to be a geek to create beautiful maps and medias that you can insert everywhere on a responsive website. Our beautiful maps let you create itineraries of all your travels and use them everywhere. 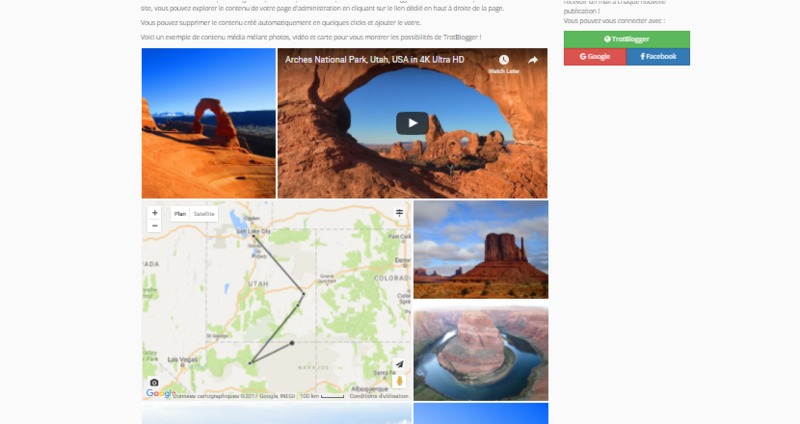 You can set on your posts beginning and endind places and it will automatically insert a map of your itinerary in your post. You can insert maps corresponding to all your travels or part of it in your posts or add a localization widget in order to let your followers know where you actually are. 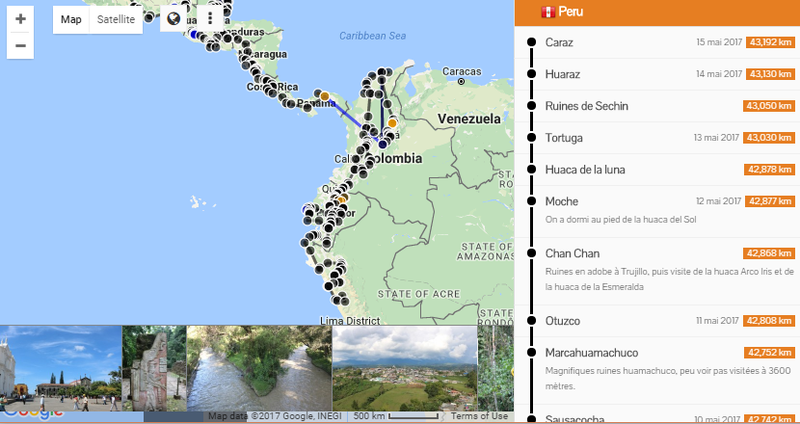 Create easily your maps with our tool, you can also use your computer geolocalization when you are traveling to add places you're visiting to your maps. In order to make your content the most attractive possible, our media displaying tool will let you layout very easily your photos, videos and maps. Your posts will be beautiful effortlessly and this will keep your readers. You can easily and elegantly display tens of photos with a map in the middle of your post and keep your post easy to read. Our designs are made to beseen on every kind of devices. You can choose a design among those offered by TrotBlogger, we regularly create new designs, then customize this design to make it unique ! Change colors, fonts, add your css or your scripts if you want in a few clicks only ! If you want a design created specially for you, contact us. Associate your photos to places you already visited and they will automatically appear on your maps. When you look at your maps, random photos taken in places in the visible area of the map will appear, making your itineraries more personal and nicer. Every information that appear on the maps can be set in parameters, letting you customizing your maps as you want and making them unique. Our tools let your users share quickly and easily your content on every social networks you want. Your content is optimized to have a nice display on social networks. You can fill your personal profile urls on social networks in order to let the pages of your website shared on social networks to be more personal.